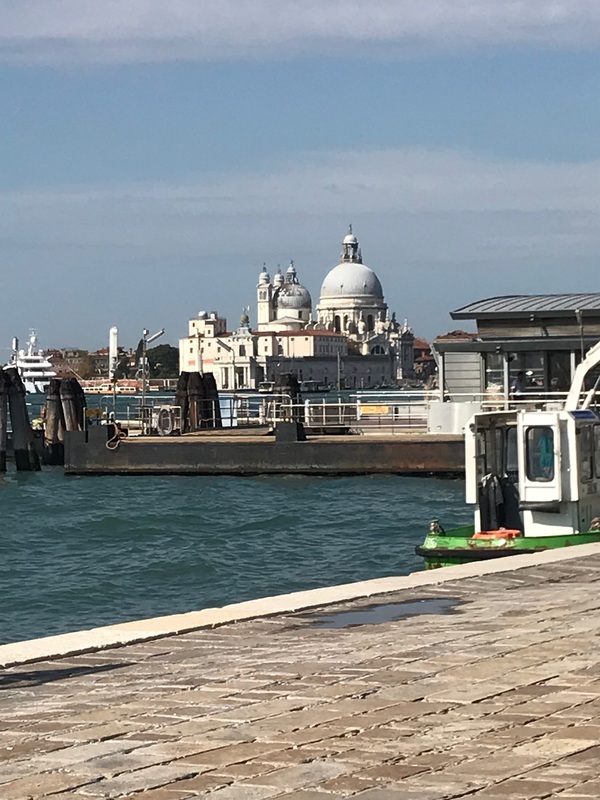 Here’s a fun thing to do: have a couple of Aperol Spritzes at lunch, plus a Negroni at Harry’s Bar, then hop on a water bus to cross the street to get to the Guggenheim Collection in time to watch them lock the front door. But more about that later. 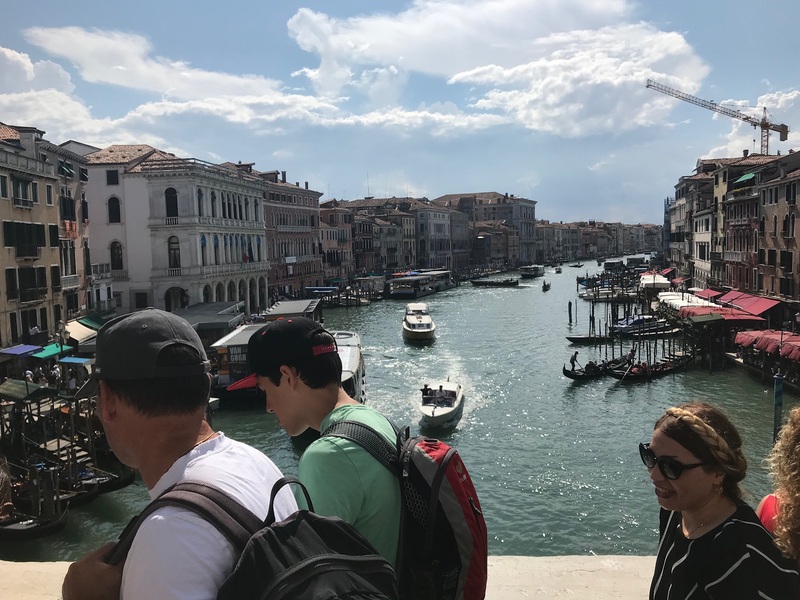 Venice is as beautiful as the photos make it look. There are no complaints there. 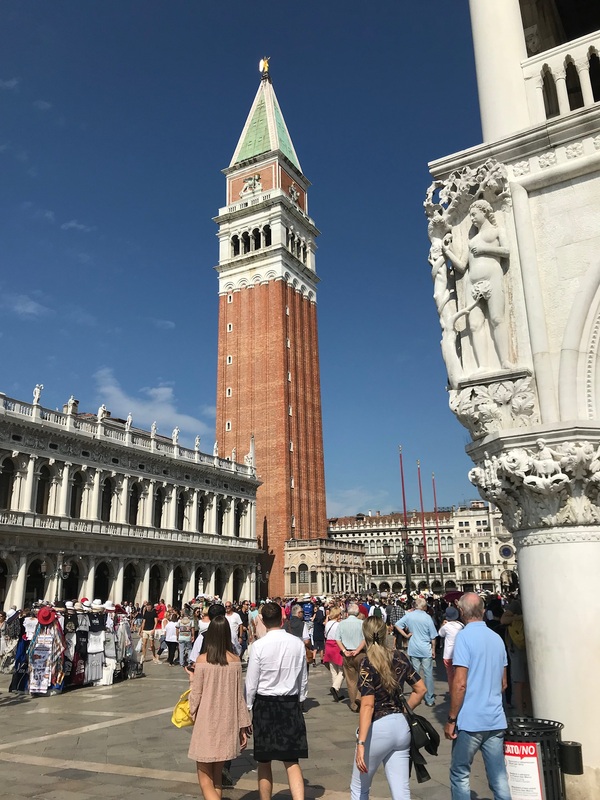 Quick history lesson: Venice started producing glass 1,000 years years ago, and for much of that time had a carefully guarded monopoly on the process. 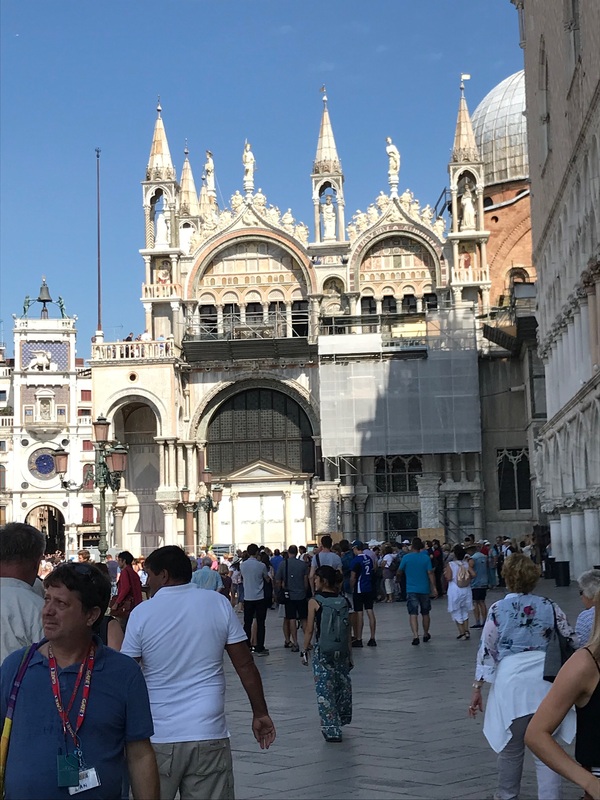 When the business really got going, the Doge decided that the risk of fires from the glass furnaces was too much and “redistricted” the glass-blowers to Murano, and so there’s a bit of cachet to the hand-blown glass of Venice. It was also expensive. I did find some cocktail coupes that were simple and elegant; they were also €150 and up—each. I love glassware, but the idea of serving cocktails in a glass that cost as much as a bottle of brilliant single malt scotch was off-putting. 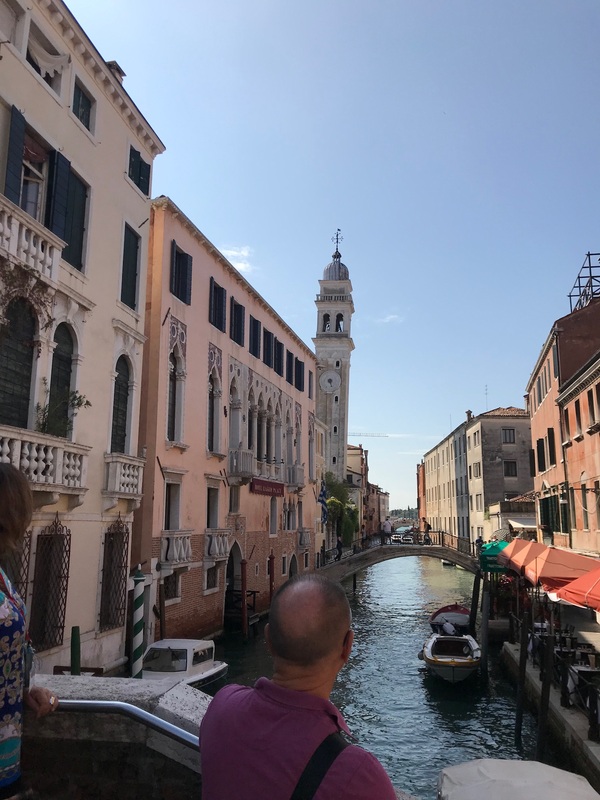 Back in Venice, we were introduced to Carlo, our tour guide for the morning. We were treated to the Museo Correr, which started well enough with the restored rooms from the Napoleonic era, including a lovely ballroom, but it degenerated into an endless stream of facts, dates, and names from poor Carlo, who seemed to think that we needed to know every single detail about whatever was in front of us. When he started giving us dates on the model of the large gilded galley used by the Doge, including the last time it was used, how the superstructure was stripped and burned and the ashes shipped to somewhere and processed to reclaim for the gold and then the galley itself was used as a prison for a couple of decades and finally dismantled in 1837… I took my earphone out and enjoyed the silence. The ballroom. 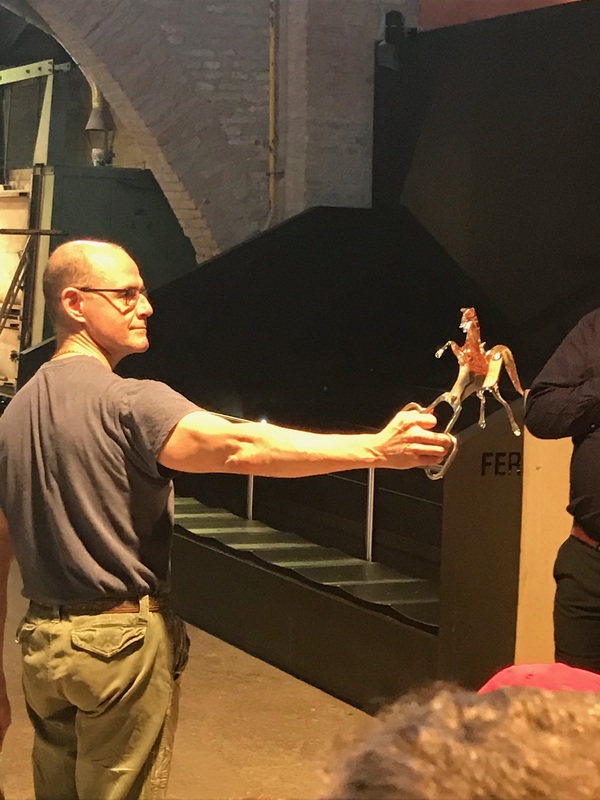 The LFW and I got in a couple of measures of a waltz. 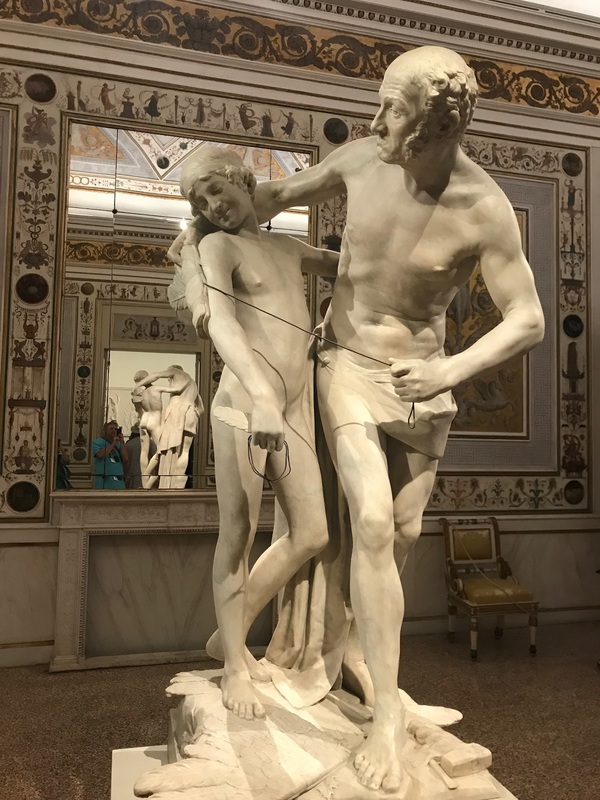 Sidebar: Canova was the famous 19th-c. Venetian sculptor, and as Carlo was telling us the entire myth of Daedalus and Icarus, I was reminded that I have an opera to finish. Finally our tour guide led us out, we told him Grazie, and sent him on his way. 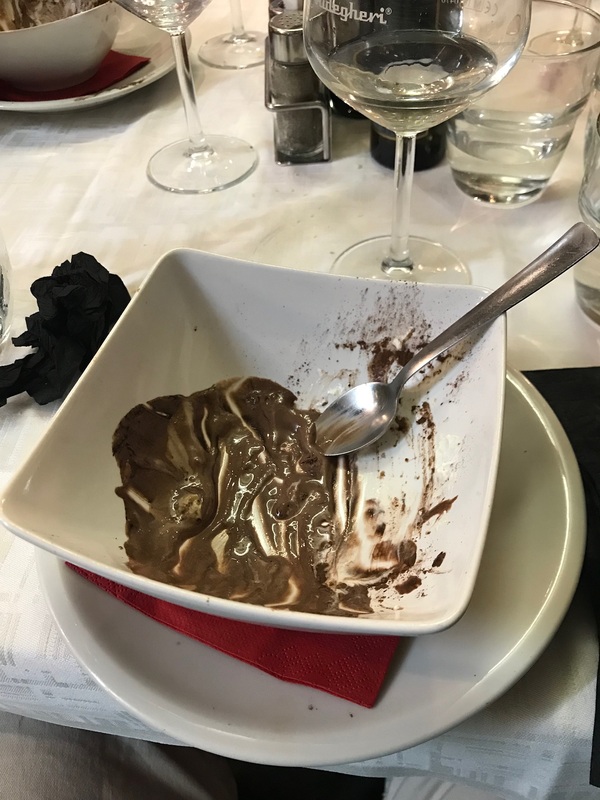 Here’s a thing you need to know about Italy: they do not eat lunch until after 1:00, and dinner may not be until 7:30 or later. We were starving at that point, so we wandered aimlessly until we found a canal-side establishment and scarfed down a pizza. 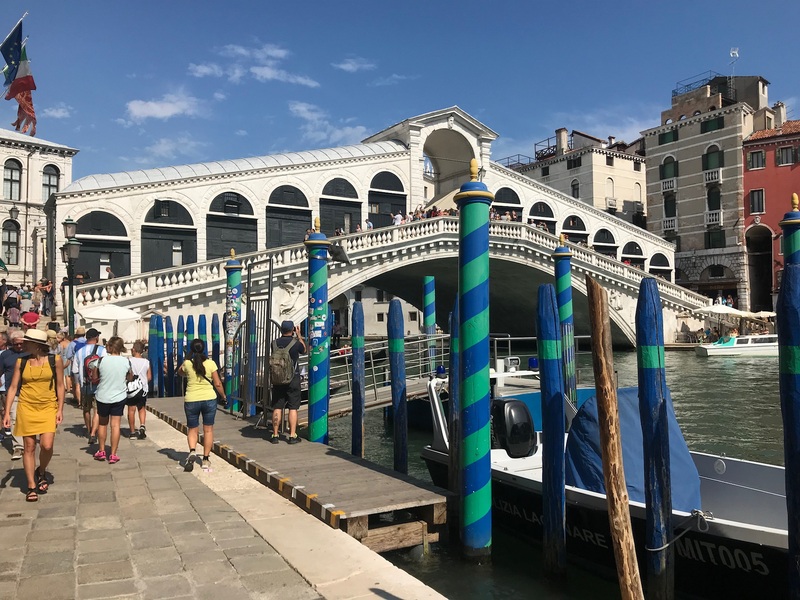 …and here’s a shot from the Rialto Bridge. This was where we had multiple Aperol Spritzes. 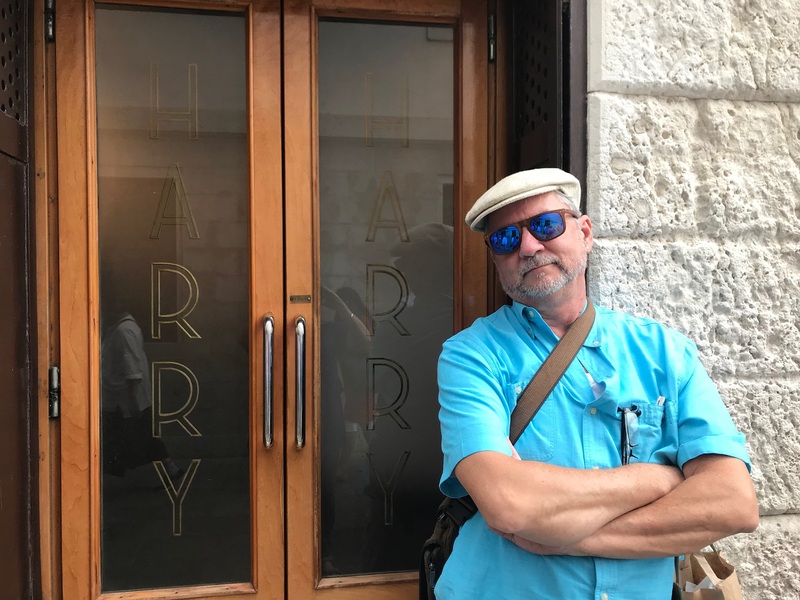 I had forgotten that third ingredient was prosecco, so by the time we wandered back into St. Mark’s Square to find Harry’s Bar — to follow in the footsteps of Hemingway, of course — we did not need that third cocktail that we all had. 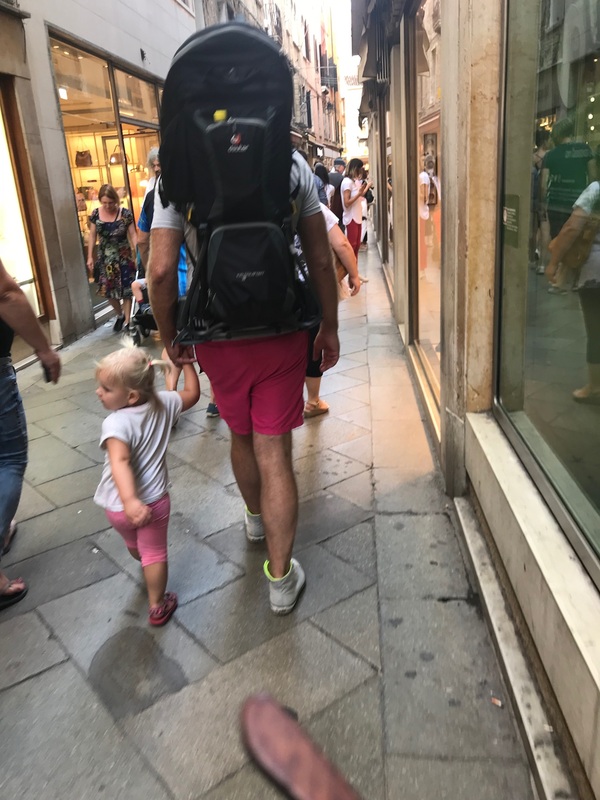 On the way back to Piazza San Marco, here’s the Dad of the Week, who has dressed like his daughter, which I thought was just adorable. These are the signs you see on buildings as you thread your way through the rabbit warren of streets in Venice, and as long as you can orient your hotel to one of the major landmarks, you really can’t get lost. Plus, as Ignazio said, you’re on an island. Here’s a fun fact about Harry’s Bar: it’s boring. The décor is stark without being lovely. They have all the usual wines and stuff, but their cocktail list is completely unimaginative, nothing more than standard stuff. It is well-made standard stuff, but it is merely standard stuff, and it is expensive. As is my custom, I check out the backbar to see what they have and what they could make if I asked them. One of our party wanted a Bijou, which I assured her they could make, since they had gin, sweet vermouth, and green Chartreuse. But the waiter returned and said, alas, they could not make a Bijou. Whether they were lying or ignorant or lazy, I have no idea, but you can strike Harry’s Bar off your list of cocktail meccas. The LFW is mistress of the Top 10 travel books, and one of her goals was make it to the Peggy Guggenheim Collection. We checked the map, and we were practically right across the canal from it. “Practically” is probably the wrong word, since to get there would be a 40-minute walk along the canal, across a bridge, and back, and we really only had 40 minutes or so until the museum closed. So we took a water bus. 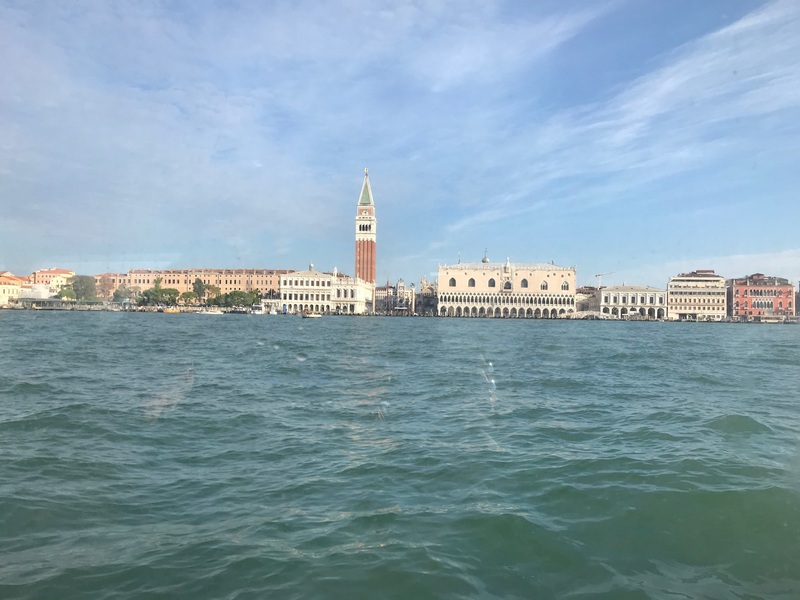 We have learned in our travels not to be afraid of public transport, and just because Venice’s happens to be boats was no reason to flinch now. 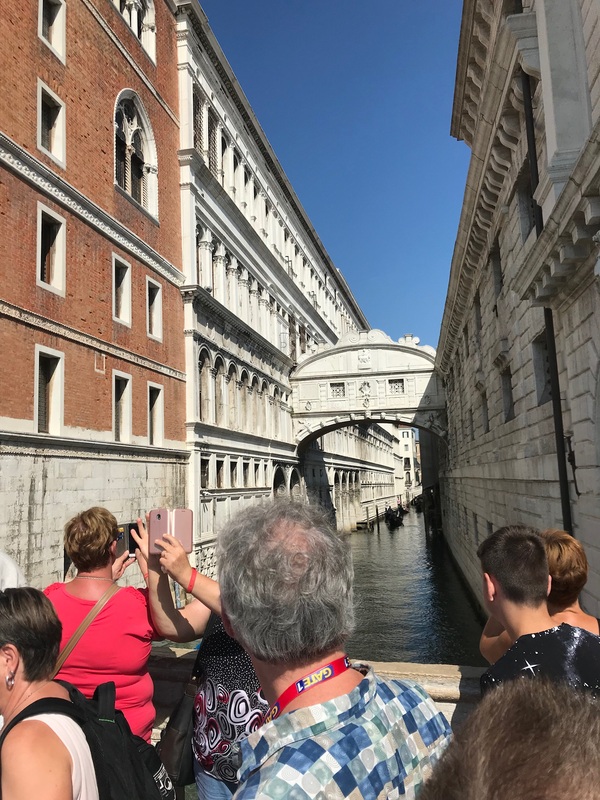 We went to the nearest stop, bought tickets, hopped on, and were taken to the next stop, nearly directly across the canal and a hop skip and a jump to the museum. We got there just in time to see them lock the door at 5:30, when their ticket sales ceased. We went back to the museum gift shop and assuaged our sorrow with purchases. Then we began the long trek back to the hotel, stopping to peek into an Anglican church that was not only open but having a service. It was a bit odd to see a Laotian congregation having an Anglican Church service in English, complete with projected responses and hymns, but there we were. 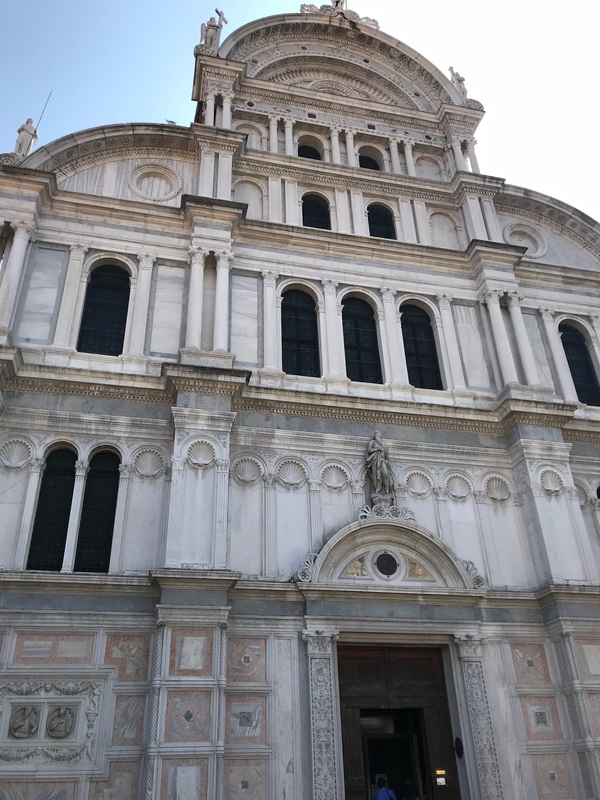 There were a couple of other churches we stopped in—no memory of their names—and they were variously Romanesque or Baroque and empty. Finally, our feet were sore and it looked like rain, so Marc calculated that we should just hop another water bus and go straight to the hotel rather than walking the very long way around. And so we did. My theory is supported by the fact that as soon as they built a bridge to the mainland, the population dropped precipitously. Venice now has the same population as Newnan. 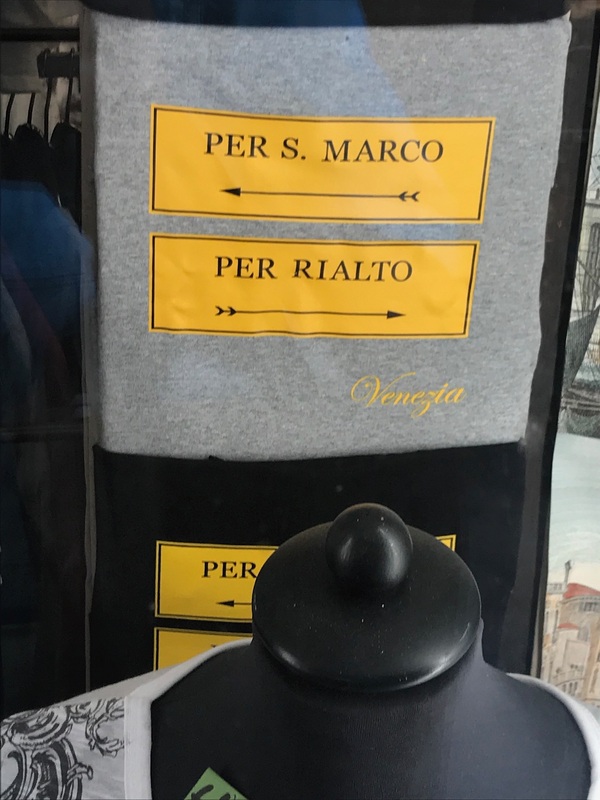 Of course, it’s still Venice. 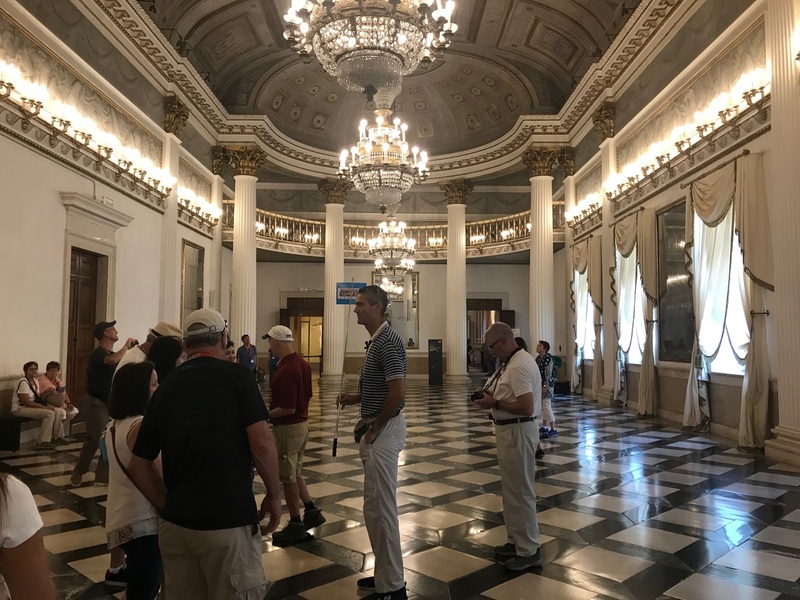 Our tour manager Ignazio told us that they did a study back in the 70s and determined that the optimal number of tourists was about 7 million. Last year, there were 33 million. Moar pics of swarthy Italian mens plz.